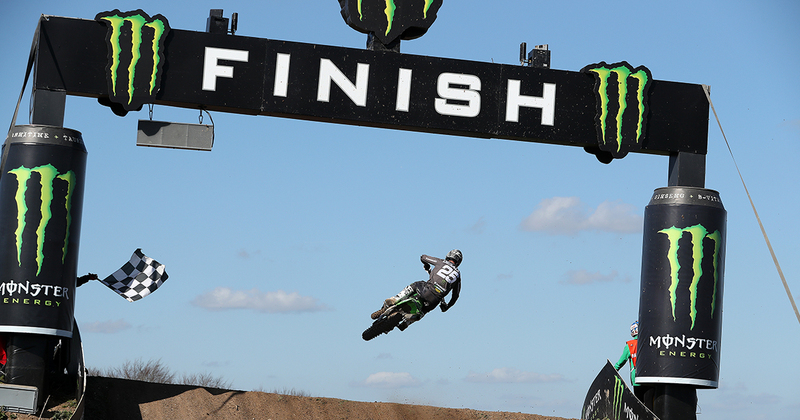 Clement Desalle of the Monster Energy Kawasaki Racing Team rode a spirited second moto to finish fourth overall in the British round of the FIM MXGP World Motocross Championship at Matterley Basin. The Belgian defied a painful hand injury from the previous day to ride a copybook race to fourth place in the opening moto at the superbly-prepared grassland track in the south of England which inevitably became heavily-rutted at this time of the year. The overall podium looked a distinct possibility as the twenty-nine year old swept confidently through the opening turns in the top six at the start of race two, but fate was to takes its toll as he was involved in a collision which also claimed teammate Julien Lieber as they entered turn three. Rejoining the race last the Belgian had already passed sixteen rivals by the completion of the first full lap and, posting faster lap times in traffic than the rider in third place, he continued to charge relentlessly to the end of the race, his last lap pass for seventh earning him fourth overall on the day. Clement is now fifth in the series standings. KRT teammate Julien Lieber found himself thirteenth after the initial sort-out in the wide sweeping first turn at the start of race one and he put in a workmanlike ride to take tenth place on the final lap despite a fall the first time he broke into the top ten midway through the race. Joining his teammate in a better start to race two Julien’s hopes were soon dashed in the turn three incident. After rejoining the race he persevered to the chequered flag, earning a point with his final pass three laps from the end. The Belgian is now twelfth in the series standings. BOS Factory pilot Tommy Searle’s high hopes for his home GP were devastated at the opening 180 degree turn of each race as he was run off the track by other riders. Initially fifteenth in race one, he advanced methodically to eleventh by the close but had to settle for fifteenth in race two. His brave efforts were sufficient to retain his top ten ranking in the series standings. Alessandro Lupino of the Gebben Van Venrooy Kawasaki Team raced to thirteenth place from outside the top twenty in race two after a big crash in the first one.